You read correctly. Sunglasses are not just a vital accessory in the sunny season. Although most of us are informed of the dangers the sun poses to our eyes during the summer, how many realize that we need to take precautions during the winter months as well? In truth, the ultraviolet rays that shine down on you during the summer months are still around in the winter. And they still threaten your eyes, especially when bounced off a bright snow. Those of you who enjoy get-aways that involve outdoor winter sports should be especially careful because you'll spend a long time in the intense reflected sunlight which can be harmful to the eye. It's very important to protect your eyes from UV rays. So what's the best way to protect your eyes in the cold season? Optometrists suggest wearing sunglasses that block UV rays, so ensure that you purchase a quality pair of sunglasses because you'll wear it all year round. Select a pair that is fitting and completely protects your eyes. 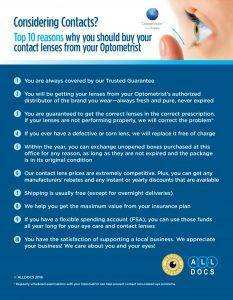 Our professionals can assist you to ensure you're buying sunglasses that provide you with the best protection. In addition, there are a variety of different lenses available and we can help you choose the combination that suits your lifestyle. Don't neglect your eyes on the slopes either. The right pair of ski goggles with polycarbonate lenses can help defend your eyes from renegade branches, reckless ski pole tips and other slope hazards. This winter make sure you sport your shades… you will see the difference.